Evaporator coils, condensate drain pans, filters and duct-work in air conditioning systems can be an excellent breeding ground for bacteria and mold. Left untreated, it can grow and eventually affect indoor air quality, a major concern of the IAQ movement today. Our Bio-Fresh Fogging service will help correct this problem by inhibiting the growth of bacteria or mold. 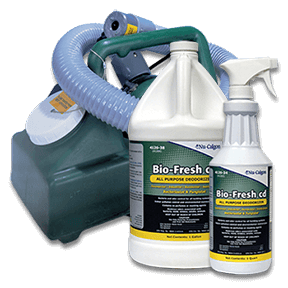 Nu-Calgon Bio-Fresh cd is a bacteriostat, fungistat and deodorizer based upon chlorine dioxide technology. We recommend it for control of bacteria, mold, mildew, fungi and yeast in your HVAC system. The product is EPA registered for application in HVACR equipment, including coils, condensate pans, filters and ductwork. Help Control Odors Associated With Bacteria, Mold, Mildew, Animals, Smoke, etc.